From the period before Andy Warhol became Andy Warhol, he was known primarily as a successful commercial illustrator and art collector. But, of course, he was an artist even then, and in his Drawings and Watercolors of the 1950’s Exhibition at Guy Hepner, which were often traced on onionskin paper from photographs, we can see him feeling his way toward the Pop style that would eventually make him a household name. The Exhibit include collections, In the Bottom of My Garden, Wild Rasberries and A la Recherche du Shoe Perdu. The first of these collections was Warhol’s A la Recherche du Shoe Perdu, in 1955 while working as an illustrator for a shoe ad, where he made new drawings of shoes each week for ads in the New York Times. The title comes from Marcel Proust’s famous novel À la recherche du temps perdu (Remembrance of Things Past). 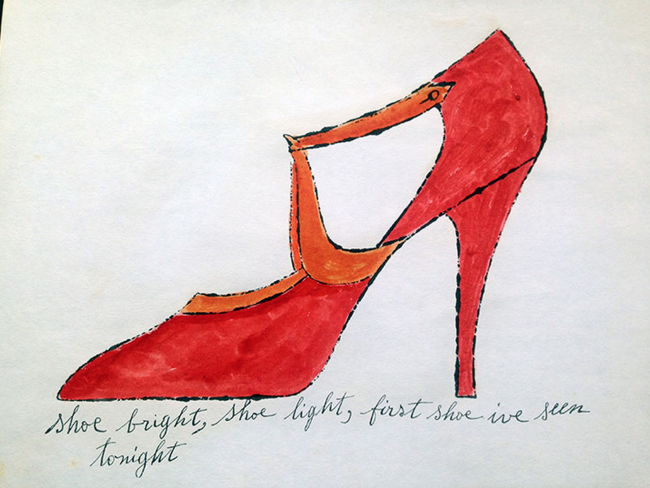 Each drawing consists of a sole shoe with a caption of a famous saying of the time or name them after socialites and celebrities, usually in his mother’s hand writing. 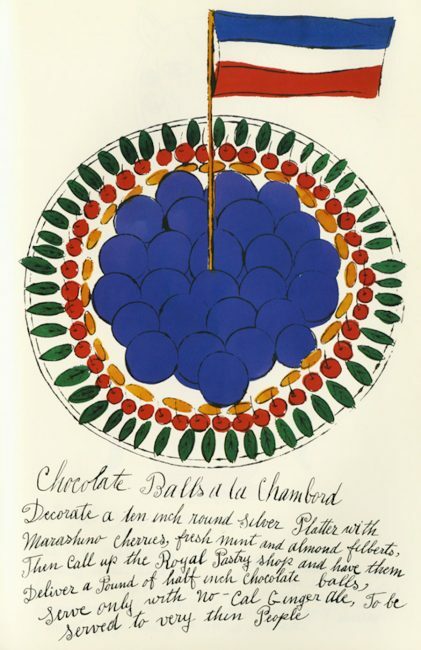 Warhol and his friends then hand-colored the sheets at coloring parties. The next collection Andy Warhol made was called In the Bottom of my Garden, in 1956. The drawings on lithograph, Inspired by a children’s book,Flower Fairies of Autumn, are filled with a whimsy scene of joyful prancing fairies. Take a closer look and you’ll notice its no children’s book at all, fornicating pink cherubs frolicking across an empty plane with delicate flowers covering their gender neutral naughty parts. Stephen Bruce, the owner of a successful café known as Serendipity, would take Andy Warhol’s rejected drawings to exhibit at his new café set. Not too long after, magazine editors, art directors, and theater people would flock into the café and admire his work, and would eventually meet admirer Suzie Frankfurt. Together they created the next collection exhibited, Wild Rasberries cookbook, a more comical and artistic than culinary creation, but all around joy to read. It was not until 1997, however that the 34 full-color books of cultural treasure were discovered and released by Suzie Frankfurt’s son, Jaime. 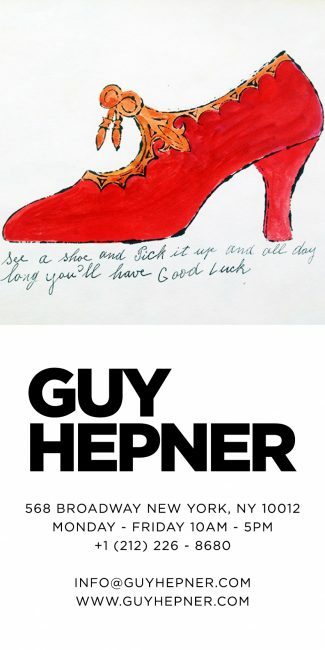 Guy Hepner sells Andy Warhol originals, posters, papers, paintings, prints, and canvases. Inquire about prices to buy Andy Warhol art work for sale.